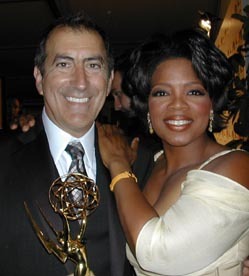 (Los Angeles) Director/choreographer Kenny Ortega, who first gained recognition as a film choreographer working alongside his mentor Gene Kelly on the critically acclaimed “One from the Heart” by Francis Ford Coppola and then next on the musical “Xanadu” won two Emmy awards for Outstanding Direction For A Variety, Music or Comedy Special and Outstanding Choreography at the 54th Annual Emmy Awards at the Shrine Auditorium in Los Angeles this evening. Ortega was responsible for directing a cast of 10000 performers under icy weather conditions at Rice-Eccles Stadium in Salt Lake City. Ortega served as supervising choreographer, artistic director and co-producer of the Salt Lake 2002 Opening Ceremony (produced by Don Mischer Productions). This television season, Ortega directs the much talked about new series “Girls Club” for producer David E. Kelley and returns to direct the award-winning multi-generational “Gilmore Girls” on The WB. He also joins executive producer Jeff Margolis as producer for “The Disco Ball...A 30-Year Celebration,” a two-hour movie-of-the-week for ABC. Last month, Ortega received the Golden Eagle award for Lifetime Achievement from Nosotros, an organization founded in 1970 by Ricardo Montalbán to improve the image of Latinos/Hispanics in the entertainment industry. Ortega has choreographed over 20 movies, staged major performances like Barbara Streisand’s “Timeless” concert which he also co-wrote with Streisand, and added a number of notable film and television directorial credits to his list of achievements. Thanks to a 20-year, professional association with legendary executive producer Don Mischer, Ortega has helped create some of the most memorable event spectaculars in modern times. Ortega’s choreography on the landmark 1987 film “Dirty Dancing” earned him the Golden Eagle Award for Outstanding Choreography, the National Academy of Dance Award for Best Dance Movie and rekindled worldwide interest in ballroom and Latin dance. Playing off his roots as artistic director and a member of the 60s Rock'n'Roll band The Tubes, Ortega quickly became the choreographer of choice for artists such as Billy Joel, Elton John, Fleetwood Mac, Madonna, The Pointer Sisters and Rod Stewart.